(Nanowerk Spotlight) Individual carbon nanotubes (CNTs) of different structural and thus electronic characteristics can be joined to build up three-terminal logic devices. However, today this can only be achieved using highly sophisticated nanomanipulation processes. The direct growth of intrinsic functional CNT elements such as Y-shaped CNTS (YCNTs) and helical CNTs (HCNTs) can be considered as an important alternative. YCNTs already have proven to show rapid and nonlinear transistor action without the need for external gating, while HCNTs could be used as inductive elements offering rapid signal processing. Additionally, HCNTs have shown operational functionality as high sensitivity force and mass sensors and are of great interest for nanoelectromechanical systems (NEMS). A research group in Spain now reports that sulfur may be used as a highly efficient additive in chemical vapor deposition (CVD) processes, allowing enhanced selectivity in the synthesis of helical and Y-shaped CNTs. CVD techniques are widely used to fabricate these functional CNT elements. It has been reported previously that sulfur can be used to produce HCNTs, YCNTs or even double-wall carbon nanotubes. However, the situation seemed to be quite controversial under which conditions a specific type of these above mentioned tubes could grow. To research the possible effects of sulfur on the growth of CNTs, the Spanish group carried out two approaches: (a) for the first time sulfur is added to the sol–gel catalysts directly at the stage of their fabrication (sulfonated catalysts), and (b) sulfur is introduced in the form of thiophene vapor into the reaction system containing the original non-sulfonated sol–gel catalysts. Dr. Ana Benito, a member of the Group of Carbon Nanostructures and Nanotechnology at Instituto de Carboquimica in Zaragoza, Spain, explained the scientific core of her group's findings to Nanowerk: "Our results underline the general importance of the nature of the sol-gel matrix itself for the formation of HCNTs as well of the local fluctuations in the gas phase for the growth of YCNTs. We show that additives efficiently can be used to control the catalyst system during preparation with respect to its composition and catalyst-support interaction, as well as to control the processes in the gas phase with respect to local fluctuations." It is highly likely that other additives might be of great use as well, however one important advantage of employing sulfur is that no additional impurities of this specific additive are detected in the final HCNT and YCNT materials. "The starting point of our work was to use sulphur as additive in CVD processes" says Cristina Valles, "but the key-to-success was to employ it in different ways. For the first time, we used sulfur compounds containing the catalyst itself already to fabricate sulfonated catalyst systems with specific stoicheometries. Here we found that sulfur leads to important changes in the phase composition of the catalyst system." Valles is first author of a recent paper that describes the Spanish group's findings ("Towards helical and Y-shaped carbon nanotubes: the role of sulfur in CVD processes"). Valles notes that this is responsible for a different distribution of the catalyst in the support matrix as well as for different catalyst matrix interactions. These changes not only are highly favorable for the growth of HCNTs but even more demonstrate that their growth is directly influenced by the composition of the catalyst system itself. Valles summarizes the conclusion of their work: "On the other hand, we showed that the use of sulfur vapor as additive during CVD process and the use of proper flow conditions can enhance the local fluctuations in the gas phase in such a way that the directional growth of nanotubes is influenced by the introduction of carbon pentagonal/heptagonal defects. Controlling the right ratio of sulfur to hydrocarbon feedstock support then may result in the selective growth for YCNTs with tailored properties. In any case, from these experiments we clearly learned that the formation of YCNTs is directly related to processes taking place in the gas phase, while the growth of HCNTs is closely linked to the catalyst-support system itself. Therefore, we clearly can say which type of parameters have to be changed to obtain one ore the other form." "Unfortunately" says Benito, "selective growth also meant lower production rates in our experiments. However, knowing that in the case of HCNTs the whole catalyst-matrix system (type of catalyst, type of additive, the composition, the degree of catalyst dispersion, the degree of catalyst matrix interaction etc) is responsible for their growth, proper chemical and structural modifications (there are really a vast number of possibilities), offer a high potential to overcome not only the problem of production rates, but, moreover, also the one of structural homogeneity." In case of YCNTs, the issues of production rates and structural homogeneity might not be solved that easily since their formation is influenced by gas-phase processes. However, the CVD production technique is a highly versatile technique and control of local fluctuations and responsible for the directional growth of carbon nanotubes might be obtained as well. Another important research line of the Group of Carbon Nanostructures and Nanotechnology is the development of highly functional and processable CNT composite materials. 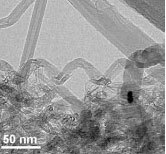 "Up to now" says Dr. Wolfgang Maser, a group member, "we achieved very exciting results with the straight forms of carbon nanotubes. Using polyaniline as matrix material and we achieved a polyaniline-carbon nanotube composite material with drastically enhanced conductivity, thermal stability and processability ("A soluble and highly functional polyaniline–carbon nanotube composite" and "Soluble Self-Aligned Carbon Nanotube/Polyaniline Composites"). More recently we demonstrated that these composite materials also can be made optically active ("Optically Active Polymer Carbon Nanotube Composite" and "Synthesis and Properties of Optically Active Polyaniline Carbon Nanotube Composites")." "Here, the use of HCNTs probably might lead to further enhancement of this feature. These highly optical active, conducting and processable material then could be efficiently used of the synthesis of pure racemic structures which is of great interest to pharmaceutical and agricultural industry. Therefore, we are very interested in using nanotubes with different kind of characteristics to develop highly functional composite materials for various kinds of technological applications."